N++, not a PS+ game. The PlayStation 4 exclusive indie platformer game, N++, will be launching later this month on July 28, Sony announced today. The game is set in the distant future, and sees players play the role of a ninja, who must make his way through deadly, hand crafted levels – all 2,360 of them – and evade the lethal traps and homicidal robots that populate all of them. If over 2,000 actual designed levels wasn’t enough to keep you returning, the game will also have leaderboards and a level editor, where you can create and share your own maps with the world. 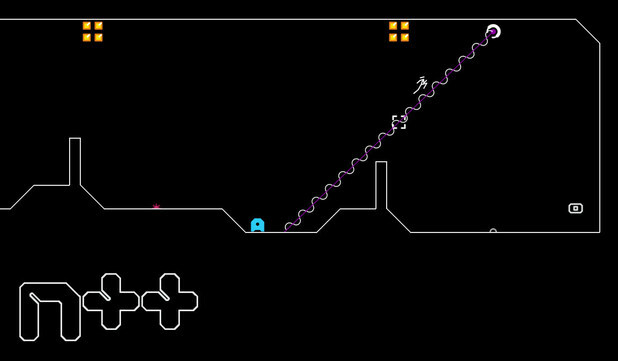 N++ will be available on the PS Store July 28 for $19.99, and if you are a PS Plus user, you can grab it for $15.99 if you pre-order. Personally, if ever there was a game that should be pre-ordered, this is it- it looks great, and it has a staggering amount of content. Stay tuned for more coverage, and check out the trailer below.